A new paper from the Institute of Fiscal Studies “What Can Wages and Employment Tell Us about the UK's Productivity Puzzle?” (see link to right or below) by Blundell, Crawford and Jin has a careful look at individual data on employment and wages, noting that “compared to previous recessions, real wages have fallen significantly within jobs this time round” and “one possibility is that the labour supply in the UK is higher compared to previous recessions”. Overall, we show that the supply of workers in this recession is higher than in previous recessions: the labour supply curve has shifted to the right. However, despite the increase in supply occurring among groups towards the lower end of the jobs market, there is strong evidence against the composition or quality-of-labour hypothesis as a potential explanation for the reduction in wages and hence productivity that we observe. By contrast, we find significant real wage reductions among individuals who have stayed in the same job year-on-year, with around one-third of workers experiencing nominal wage freezes or cuts between 2010 and 2011 and 70% experiencing real wage cuts (on the basis of the RPI). So the real question is: why have wages for existing workers been able to fall so much in this recession compared to previous recessions? Part of the explanation is the higher labour supply that we observe in this recession. We provide some evidence that a combination of policy changes and reductions in the value of household wealth may have contributed to this. This means that there are more individuals willing to work at any given wage and thus that there is likely to be greater competition for jobs. As a consequence workers are likely to have lower reservation wages than in the past and seem to attach more weight to staying in work (because their expected time to find another job is longer than in the past) than on securing higher wages and are thus willing to accept lower wages in exchange for holding onto their job. This is consistent with the findings of Gregg et al. (2013), who show that wages have become more responsive to local unemployment rates since the early 2000s." "We know that the population of working age has increased substantially over the last 30 years – from 35.4 million in 1981 to 40.5 million in 2011– a substantial proportion of which is due to net migration." But the next section “How Has Labour Supply in the UK Changed Over Time?” doesn’t illustrate or say anything about the impact of this on the workforce or how employment levels have been affected by it. On the other hand it shows and considers in detail some rather smaller components of change, like the changing numbers of older people and single parents. As always with migration there are two issues: 1. might migration itself have an impact? and 2. might there be something else whose impact is being obscured by migration? The paper does cover include something of the possible impact of migration in a set of compositional analyses that take different individual characteristics into account, and one of these is nationality. Because most of the previous research on the impact of migration on both jobs and wages has used country of birth to identify migrants rather than nationality I thought it might be worth observing the difference between the two before a little reflection. Here’s the picture of the change in the number of people in employment over the period, with UK nationals shown by the thick black line, and everyone else stacked up. There’s obviously some changing change here. Visually, there seem to be three distinct phases, from 1997 to early 2005 a steady rise in employment for UK nationals accompanied by increasing numbers of non-UK nationals too more or less following the same upward trend. From then, the number of UK nationals working was flat (allowing for seasonal variation) until the big recessionary drop through 2009, with a low point at the beginning of 2010 and recovery since then back up to previous levels by the end of the period. Looking at non UK nationals, there is more a trend of consistent growth, stronger before the recession and weaker afterwards, with only a slight recessionary pause. The big difference over the period was the strong growth in non UK national employment between 2005 and the start of the recession while levels for UK nationals were flat, meaning that over the whole period the contribution to growth in employment levels was roughly equally split between UK and non UK nationals, and with little change in composition of the workforce in 2012 compared with 2007. The picture for employment by country of birth over the same period looks rather different. Differences that might be significant in the real world include that employment levels for UK-born people starting dropping after the 2005 peak and allowing for seasonal fluctuations essentially carried on doing so until 2011. Growth since then has got things back only to around 2002 levels. For non UK-born people, growth returned as strongly after a brief recessionary pause as before. Over the whole period, people born outside the UK accounted for twice the increase in employment than the UK-born, and for a 10% increase in the size of the total workforce. These are big changes and in terms of labour supply in the UK it’s a far bigger change than any of the others looked at. 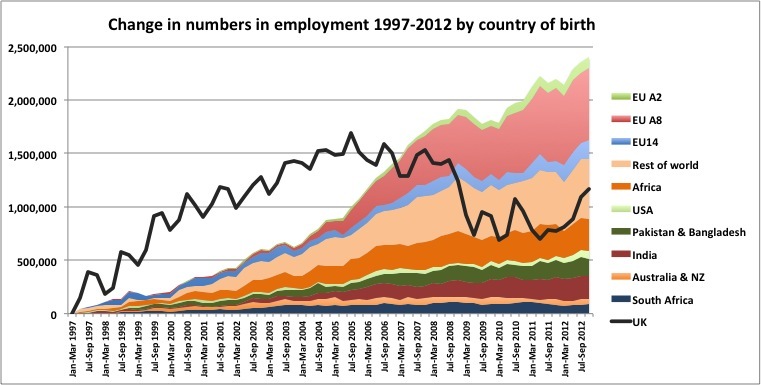 It's worth mentioning here why caution is needed in using nationality to observe change in employment levels. Change over a period in UK national employment is the sum of change in employment of people who were UK nationals at the start of the period plus the numbers of non UK nationals in work who aquired UK nationality in the period. So if in a quarter there were actually no change at all in employment but 50,000 non UK nationals acquired UK nationality, there would be a reported increase of 50,000 in employment of UK nationals, and a drop of 50,000 in employment of non UK nationals. That is clearly rather obscuring of the underlying reality. This isn't to criticise the authors, but just noting that using nationality rather than country of birth might miss something of the misty impact on migration of the labour market, and Wenchao Jin has kindly said she'll see if she can rerun the wage equations to examine any difference. The paper puzzles over why wages haven't recovered like they did after previous recessions. Well it's arguable that in previous recessions the slack to be taken up was largely comprised of people who had lost their jobs during recession, to be reassimilated into the workforce as growth and demand for labour increased without putting pressure on wages for those who had remained in work, or obviously on their employment, as however deep the recession had been, there was a clear limit on the amount of labour readily available. The most recent recession stands in clear contrast and the present situation arguably made very different not just by the availability of an alternative source of labour from abroad, but by the fact that it is in all practical terms unlimited. It doesn’t really need econometrics to suggest that awareness of this on the part of both employer and employee might put some sort of constraint on wages. The very interesting findings of the paper on different trends in wages by public and private sector and the level of collective bargaining may be a pointer to this, noting that larger falls in wages have been suffered by those in the private sector and then those less likely to be covered by collective bargaining. And it isn’t something that econometrics can necessarily capture very well. In principle it only takes one guy or girl outside the factory or office who is prepared to work for less to put the wages of everyone inside under pressure. At an individual level each worker knows that if they don’t go along with a pay freeze or reduction in wages it could be actually him or her who gets replaced by the person outside. Especially in the absence of effective union representation. obtaining new insights into the drivers of the signiﬁcant reductions in wages that we observe among those who remain in the same job year-on-year would seem to be at the heart of understanding the UK’s productivity puzzle. And I’d suggest that these drivers might include not just the direct impact of competition for jobs – whose outcome might be econometrically measurable, but also the awareness of this among existing workers and the psychological impact this might have on their perceptions of job security and power in bargaining for wage. In our particular post-recession circumstances, mere migrant numbers and the adducing of correlation coefficients etc might obscure this important dimension.